Totalcar Magazine - Tech - Replacing the computer for €1000? No way! The issue itself was no biggie except that it cost some €1500 to fix. And that’s not all: the car proved to be a minefield as we progressed. Hear the latest story from our pro in electronics. 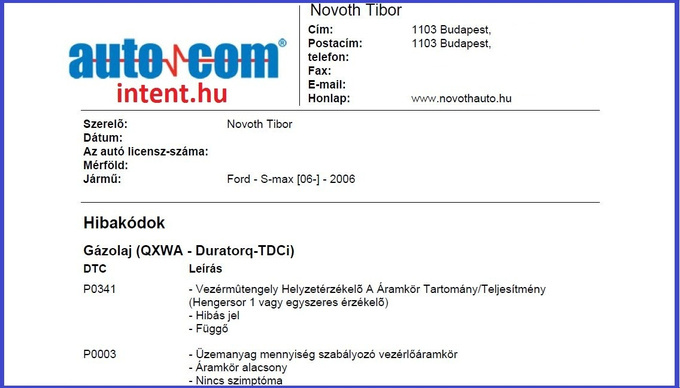 There was this 2006 Ford S-Max 2.0 TDCI towed to my repair shop. The diagnosis was simple - the car would not start. There were a handful of attempts at fixing it, such as testing the high pressure pump, but to absolutely no avail. 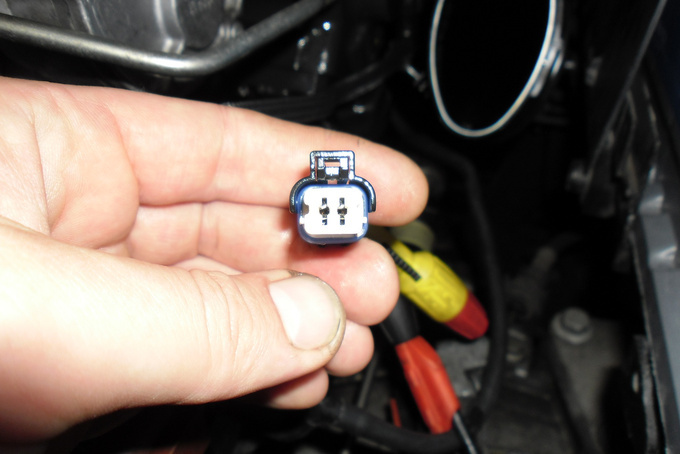 Retrieved On-Board Diagnostic (OBD) codes suggested I should check the position of the timing first, nothing wrong there. Same thing with the crankshaft and camshaft position sensors. That meant I could just disregard fault code P0341. This engine comes from the PSA Group, using a common-rail diesel injection system from Siemens. There is no fuel pump in the tank here, fuel is delivered by the pre-feed pump located in the high pressure pump housing. Because this pump and the tank are connected by some four metres of fuel line and there is also a diesel oil filter in between the two, it made absolute sense to grab a vacuum pump and check for clogging. Again, nothing here, fuel flow was unblocked. Hardly a day goes by when my oscilloscope stays switched off. Christmas would rightly come to my mind – except I do use it even on the holiest of days. Naturally I gave it a run in this case too. 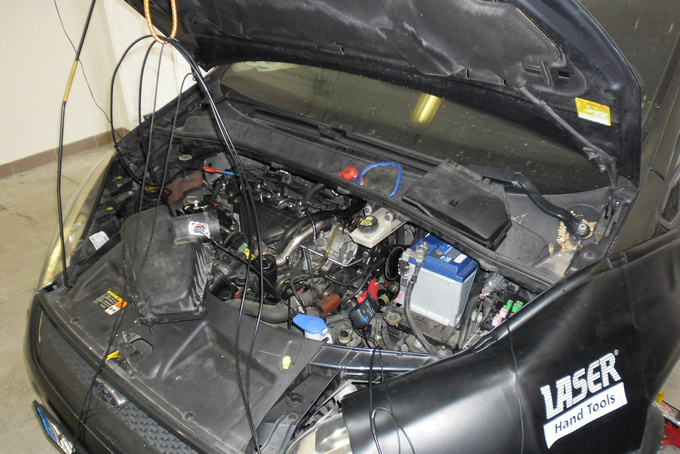 The dawn of on-board diagnostics has taken the auto repair business on a strange detour. Instead of using plain language, mechanics have began talking in code. 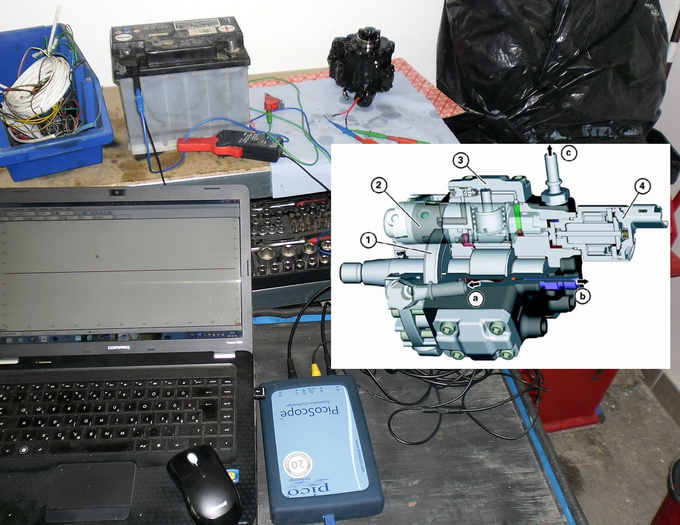 Yet by now most of us have realized that there is no such thing as an omniscient diagnostic tool, that it takes life-long learning and proper measurements to diagnose a modern engine control system. However, faults where there are no reference values to go by usually leave me scratching my head. In such cases I usually look for the missing information at internet forums where professionals join forces to help each other in case someone is in need of help. You do need to have model specific information to get proper assistance but unless it is an obvious fault even the manufacturer's database may not be very helpful. It did not take long to establish that the reason the car won't start is that the operating pressure within the common-rail is too low. 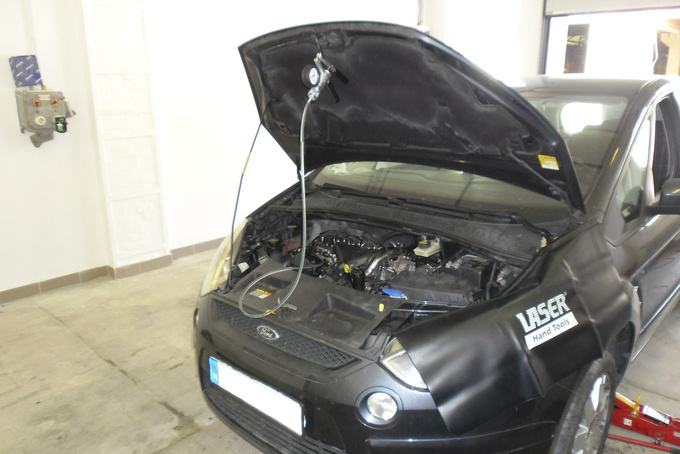 The OBD code did indicate a possible fault, and going along that lead I did check the control valves of the high pressure pump – indeed they were not operational. These valves are controlled by the engine management, employing what is known as a fill factor. In cases like this one you should always check whether the controller is only rendered dysfunctional by something as trite as a broken wire. So I removed the ECU and detached it from the harness. You may find it odd that it was located right under the front bumper, I certainly did. Why would it be positioned where it can be easily damaged? Anyway, the wires were fine but we discovered that the ECU is unable to govern the volume control valve because of internal malfunction. A complete replacement unit, including programming, would cost in excess of €1000 which meant I started looking into alternatives. Since I had been a long-time happy customer at Bosch Electronic Service Ltd. I reached out to them. If only our component acting up was from Bosch they could have run a manufacturer's test on it. Still I believe a company is worth as much as their employees and in this case this is what brought me here. Looking over the wiring diagram my man with a golden touch managed to pinpoint the culprit which could be blamed for not controlling those magnetic valves. It is the larger of the centipedal cubes, marked ST on this image; I'll just call it IC henceforth. Getting an IC proved to be harder than I'd thought. 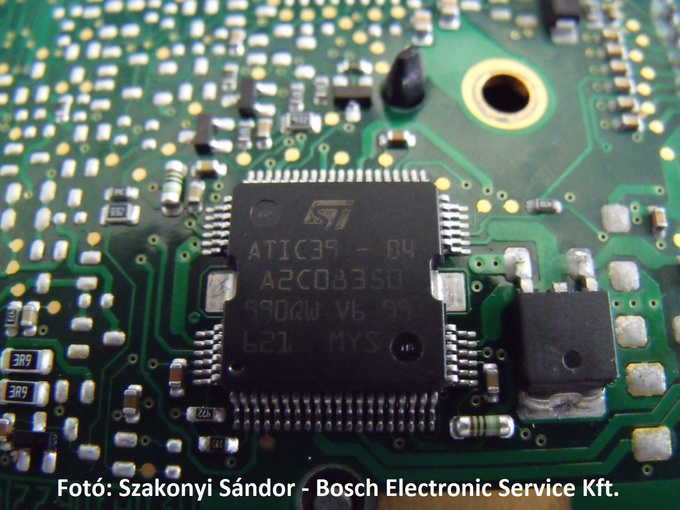 Since the controller was not a Bosch component, they didn't have it in stock, but ordering a minimum batch of a thousand units did not seem like a viable alternative, as we were talking about a relatively rare error. Assistance finally came from an internet forum member known as C20NE. He told us the programmed IC was available in – where else? – a Lithuanian webshop. We ordered it and it didn't take more than a few days to arrive. As soon as I had it I drove straight to the electronics specialist. I'll do this for you while you wait, he told me as he absent-mindedly started straightening the legs of the IC. This was exactly what I didn't want to do, I didn't feel like watching him solder the IC in place. All the while I was already visualizing myself explaining to the owner that we had no choice but to spend that €1000. 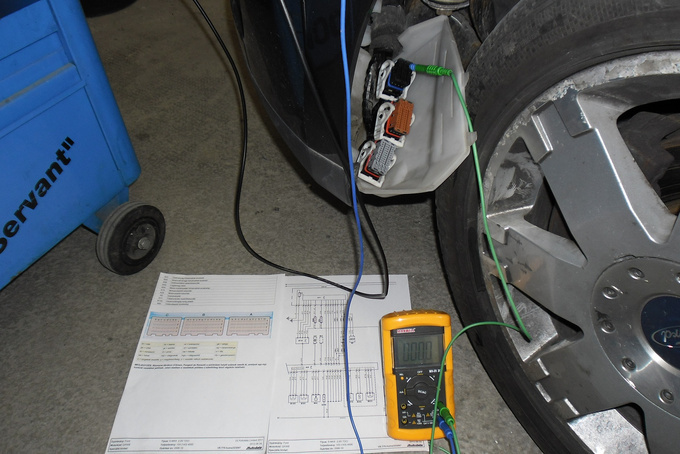 I drove straight back to my workshop, hooking the component to the harness. Ignition – still no go. I started to panic. Every profession has its tough moments. It is hard to think clearly at times but you must try. I had an apprentice working with me at that time, a university student hoping to see things they don't teach them in school. I suppose his presence was the only reason I didn't break down. In despair, I reached for my trusty oscilloscope again. It has yet to lie to me. I checked the circuit for the volume control valve. It was perfect, meaning repair has worked as expected. 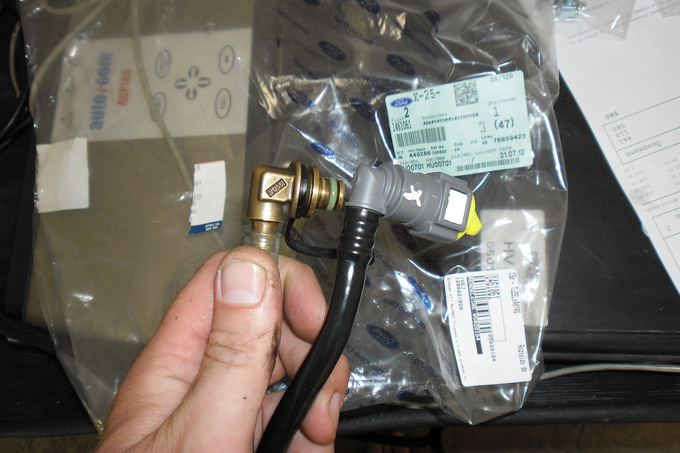 Now this is the magnetic valve which makes sure diesel fuel reaches the fuel pump in the first place; but there is also another one controlling common-rail pressure. Cheking the pressure control valve I got this strange readout. I barely measured any current (red wave) which meant this circuit was out of order. These controllers are usually fed by 12V (or the terminal voltage of the battery) and the ECU would operate them by switching the ground on or off. 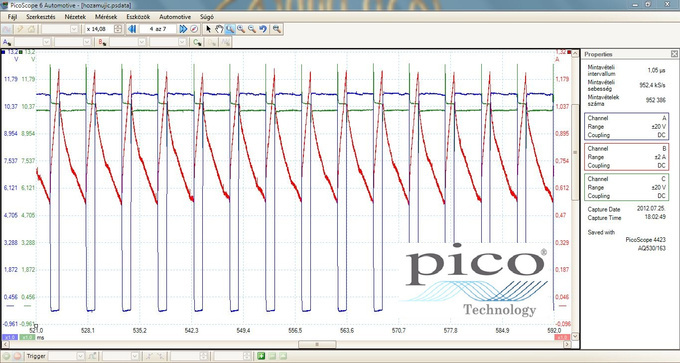 The oscillogram clearly shows that the magnetic valve has a power supply (green) but there is something wrong on the ground side. I measured a 4.2V square wave signal which would at certain points switch to a regular value (marked by red arrows). What this means is that the circuit won't close, as if the magnetic coil was broken. But I did check for that at the beginning, like I always do for errors of this type. I uninstalled the entire high-pressure pump assembly to make sure nothing was overlooked. I ran it from a battery for a sec, and there was a silent click giving it away as operational. 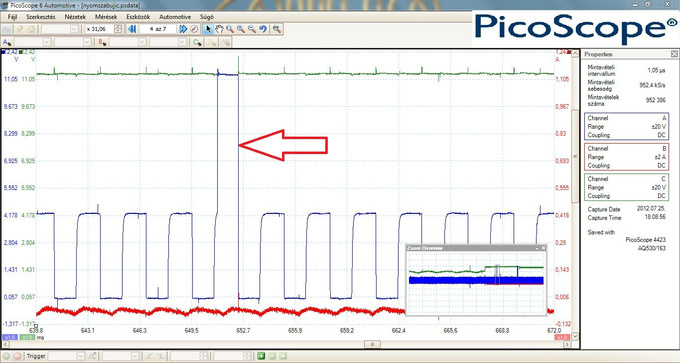 Even the oscilloscope could notice current feed into the device. Time to consult someone. I called a friend, an electrical automotive engineer. His Mum had probably decorated his cot with oscilloscopes because he can visualize any oscillogram just by hearing about it over the phone. He too agreed that the circuit must be broken; and while we were at it he taught me a few tricks of his trade. Over the phone. They are too complex to explain here and now but the point relevant to this story was pithy and concise – if I am seeing what I am seeing the controller is in fact trying to actuate the magnetic valve. I tested all the cables, the coil, so where could the fault lie? Turns out it was right under my nose all the time. The cable lugs were so loose they could not deliver the signal to the magnetic valve. I squeezed them a bit and the engine started right away. But there was another time bomb in the engine bay apart from the control unit. To solve it for once and for all I replaced the connectors to both magnetic valves. I consulted the client over the phone and he told me he'd need the car by Friday night, as they are off to Denmark the following morning. 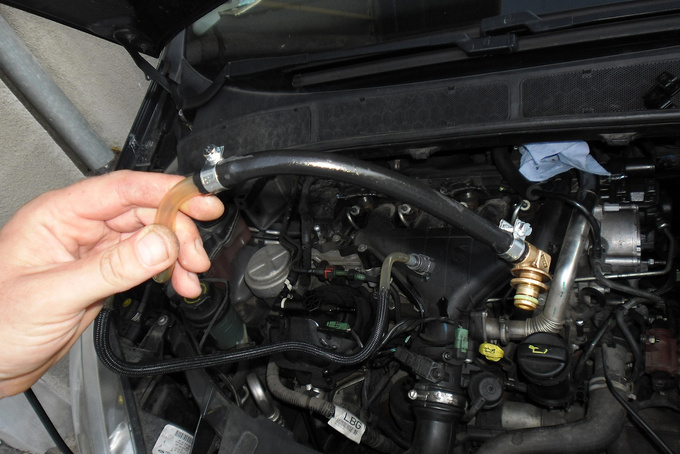 No sweat, I need to order the pipe section connecting the fuel filter and the high pressure pump – it was broken at one point which was yet another potential source of failure that I wanted to eliminate – but it should be here in four days. "You heat it a bit and it'll fit, don't worry"
Okay, make that three days. Or two. Come Friday and I was ringing my Ford spare parts shop in a bit of a frenzy. It won't be here before Monday, he tells me. Now, I don't usually work on deadlines but this was a special case, my client needed the car. I am probably less patient with people than with cars, something that may have come across as we spoke on the phone. To cut the long story short, I got what I needed. Except it didn't fit, at least not completely. The connector marked with the white X in this image should look like the one on the left. Aw, you'll warm it up and make it fit, the parts guy told me. I had no time to lecture him on how I prefer to make repairs to factory specification instead of doing a makeshift hack job – it was 4:30 PM and I had a car to deliver to the client. I removed the connector from the new pipe. It turned out there was no way to fit the old connectors in there, so there, I blew €40 on nothing, not a nice way to finish a day. So I took the old pipe and replaced the broken section with a flexible fuel line. End of the story: the car travelled to Denmark and back, and has covered several thousand kilometres since. But the pipe, that still needs replacing. If anyone reading this happens to sell Ford spare parts for a living and is able to find me factory fittings, would you please come forward and contact me? The dashcam recording shows three men forcing a pedestrian into the trunk of a BMW. What the hell happened there?